Enjoy The Great Outdoors Right From Your Own Porch! 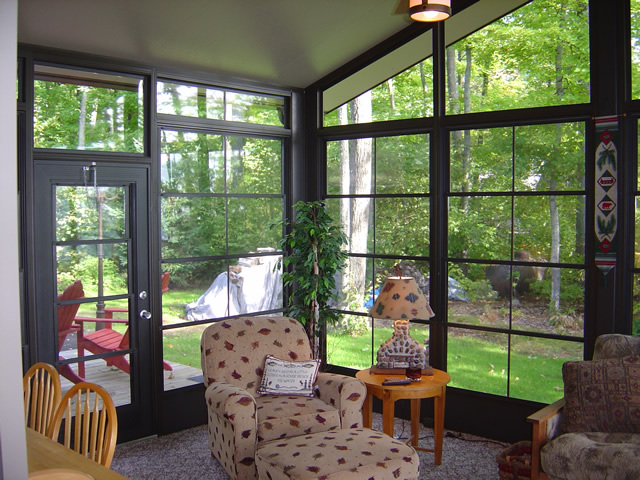 A Three Season Sunroom will not only add beauty and comfort to your home, it will also increase it's value. You’ll extend your enjoyment of the outdoors from early spring through late fall with our three season rooms. Provide you and your family with a lifestyle change that you will enjoy for years to come. 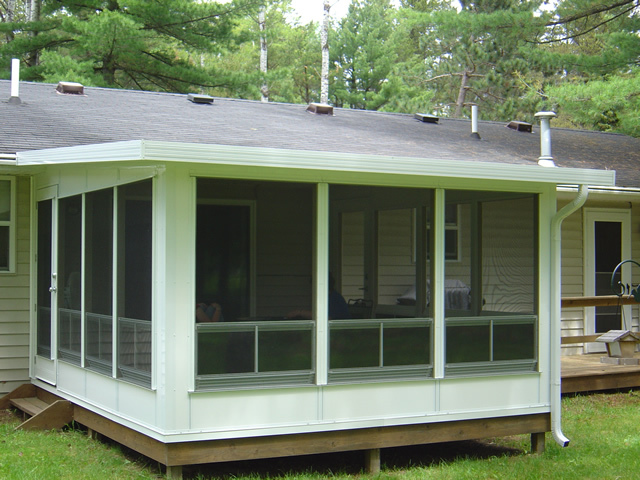 The WeatherMaster Enclosure System combines the open feeling of a screen room and the comfort and convenience of a three season sunroom. It does this by utilizing the unique design of the WeatherMaster vertical or horizontal window system. This window system features durable weather-resistant view flex glazing in 4 tints, extruded aluminum frames and sashes, stainless steel hardware and fiber mesh screens in multiple styles. Our unique design makes ventilation up to 75% when open but you can close them in seconds if the weather suddenly changes. Windows are removable for easy cleaning. 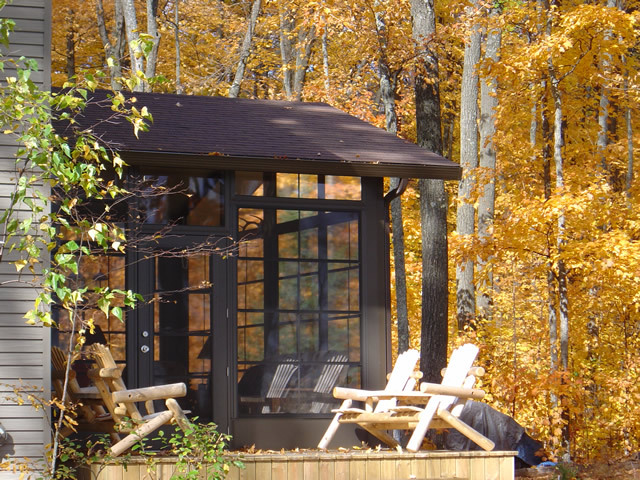 Our Three Season Sunrooms have the design flexibility that few systems can offer. All of our sunrooms are custom designed and engineered to fit the exact specifications of your homes architecture and local building codes. They are available in a variety of colors to allow you to design a sunroom that best suits your needs. Convert a deck, slab, or porch into a new room for the family, a children's play room, an exercise room, a spa room, an eating area, or just a quiet place to relax in. If you have ever considered adding to an existing deck or screening in a patio, Sunspace WeatherMaster has the system for you. WeatherMaster Walls - maintenance free aluminum skin 2" insulated foam panels let you enjoy your favorite seasons, that much longer. The walls incorporate the versatile WeatherMaster vertical 4-Track vinyl window or horizontal 2-track sliders and screen system. Built to exceed local building codes, and in most instances if you have an existing deck we can build right on top without the added costs and time associated with removal and replacement. Our wall system will give you worry and maintenance free enjoyment all year long and each sunroom has a lifetime warranty. The WeatherMaster Window Systems have been engineered to offer the most flexibility to the customer. These vinyl pane windows offer the perfect solution for homeowners seeking style and safety. Select either white, driftwood, or bronze frames with clear, smoke bronze, or dark grey vinyl. Vertical 4 Track System allows 75% ventilation openings. Horizontal 2 Track System* allows 50% ventilation openings. The patented Pressure Cap Roof System is available in 3 inch, 4 inch and 6 inch thick panels and has been designed to withstand the most severe climate conditions. Pressure Cap roof panels have high density foam core with aluminum skins laminated on both sides or have an OSB exterior to accommodate standard shingles. Every roof system has an internal water troughing system to channel away moisture and comes standard with worry free heavy duty extruded aluminum gutters and fascia. The roof interior can also be paneled in wood to match your decor. No more sun or rain driving you off your porch or deck with a Pressure Cap roof system. Turn your Three Season Room into a softly lit outdoor oasis. Our acrylic roof panels are the most advanced line of day-lighted roofing products available. Filter and soften harsh light for endless hours of pleasant illumination and shield your family from harmful UV rays. Our thermal deck consists of panels with 3.5", 5.5", and 7.5" core of insulation sandwiched between two 1/2" silicone impregnated Oriented Strand Boards giving our Thermal Deck a 25% better insulated rating than conventional floor construction. Thermal Decks eliminate costly foundation work and the finished surface can receive carpet, tile, or almost any type of flooring. By using our Thermal Deck you will save considerable construction time over building a deck using traditional methods. These are manufactured by Sunspace and come with the same lifetime warranty.